Camping Cots are a great alternative to camping mats, as it gives you the comfort and illusion of sleeping in an actual bed. The best cot will be one that is comfortable, but also lightweight. We are going to check out some top rated camping cots to save you the trouble of sifting through all the info! In this article, we have found the best camping cot for you and your needs, using the best camping cot reviews out there! It’s nice to be raised off the floor incase of damp ground, or bugs, and is easier for those with bad backs who may have trouble getting off and on a floor mat. Camping cots also give you more floor space in your tent as you can store other items under the cot, whether you've got an easy instant tent, or a larger family sized tent. 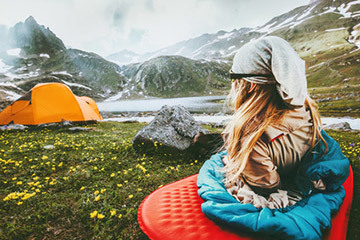 Whether it’s a best backpacking cot, or a best lightweight camping cot, or even just a cot for guest in your home, we’ve got the best reviewed camping cots below. Check out this comparison table of the best camping cots, or skip straight to the reviews. Firstly, what are some things you might need to consider when choosing the best camping cot? Just because you’re camping in the wild, or sleeping in a guest bedroom doesn’t mean you need to be uncomfortable, with stones and twigs poking into your back. This is why many people opt to sleep on a camping cot that is raised higher off the ground. 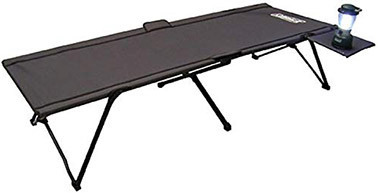 Camping cots should be comfortable for napping, resting, even reading in bed, and you definitely don’t want any metal bars digging into your back! You will need to determine the size you need when figuring out which camping cot is most suitable for you. Who is the camping cot going to be used for? How tall or heavy is this person? Look for sturdy legs, and fabric when choosing your cot. Make sure you read through the size specifications. Measure out your tent’s floor space to make sure the camping cot will fit, and when packed down, you may also need to consider the size of the cot to ensure it fits in your car. If you plan on camping near your vehicle, then the weight and portability of the camping cot will not be much of an issue. If, however, you plan on trekking and hiking before you reach your campsite, you may need to consider and look for a lightweight camping cot. Lucky for you, we have a lightweight camping cot reviewed below! Now That You Know What To Look For, Let's Take a Look at the Best Reviewed and Rated Camping Cots! Heavy duty steel frame, and tough polyester supports up to 300 lbs. Large size, extra wide, extra long up to 6 ft. 6 in. Reviewers have noted that the cot is not flimsy, and folds out and stays in place by your weight. It’s very comfortable with no bars digging into your back. The bed is raised up to 17” high so you don’t need to sit down low to get in and out of the cot. Much handier for your back! The unfolding and folding mechanism is very easy to use, and it folds away neatly in its own carrying bag that can fit in most car trunks. So comfortable that some people use it as a guest bed in their own homes! Can accommodate people up to 6 ft. 2 in. Consumers have reported that this cot is very easy to set up alone, and is very comfortable due to no centre crossbar digging into your back. The various pouches are also great to separate your personal belongings, such as a book, glasses, torch etc. However, there have been reports that the cot can rip at the seam, and this may be due to the fabric being stretched too far, and too taut. Breathable 600D double layer oxford fabric. Supports up to 450 pounds, and 6 ft. 8 in. Many people have noted that this cot is very sturdy and stable, and report that this cot is very easy to set up. The slight rise on one end of the cot is very comfortable to rest your head on even without a pillow. One reviewer does report however, that the carry bag is a bit flimsy, and can rip easily. While a little pricer than other options, you can see that this Helinox camping cot is well made and can last for years. Camping cots are a very practical and easy way to 'elevate' your camping experience. You get the comfort of an actual, raised bed, while enjoying the great outdoors, enjoying nature. Depending on your needs, and your budget, there is a perfect camping cot for your next adventure. Remember, the best camping cot is the one that works for your needs, and comfort. 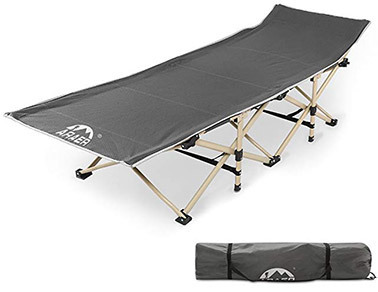 Camping cots, with the portability factor makes it so easy to move your cot from the guest bedroom, to the garden, to the tent, and to the wild!